Natural, Effective Pain Management Tool! Pure Pro Arnica Therapeutic Concentrate allows you to work deeper with less soreness for your client! Don't let the small size fool you. This concentrate is 25 times stronger than other arnica products now available. Dilute 30 drops of ATC into an 8 ounce bottle of oil or lotion for an all purpose arnica massage oil. 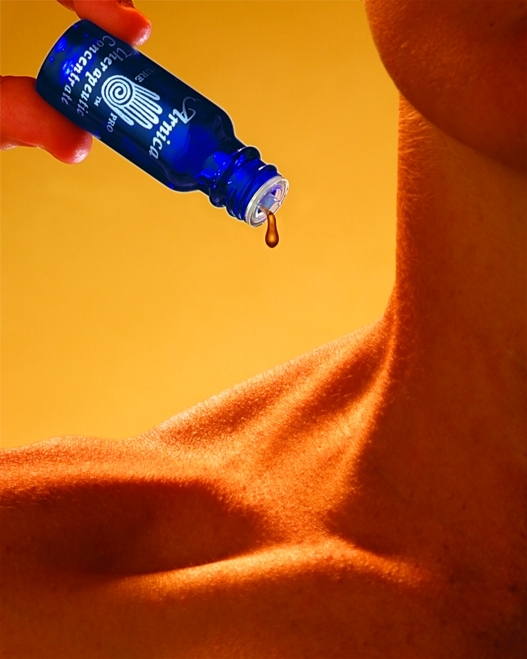 Or use 3-4 drops undiluted on serious injuries such as Tennis Elbow & Carpal Tunnel Syndrome and massage in. Also great for your own arms after a tough day of massage sessions! 100% natural. Buy a 4 Pack & SAVE! Great for Injury and Chronic Pain Management, Myofascial, Trigger Point, Neuromuscular Therapy, Deep Tissue, and Sports massage. Aids in treatment of fibromyalgia, tennis elbow, carpal tunnel syndrome, strains, sprains, and bruising. Nut free. Cruelty free. Vegan. Free of preservatives. Made in the USA. Great for Physical Therapy, Chiropractic, Sports and Injury, Neuromuscular, Myofascial, and Deep Tissue massage. Apply 3-4 drops directly to the injury site and work it into the tissue. You can then continue to work over the area with any other oil or cream. If you are treating a systemic condition such as Fibromyalgia, you can dilute Pure Pro Arnica Therapeutic Concentrate and dose the whole body! Recommended ratio is 30 drops to 8 ounces of carrier oil. You can also simply add the whole 1/2 ounce bottle to 1 gallon of carrier oil. Pure Pro Arnica Therapeutic Concentrate is nut-oil free and gentle enough for use on sensitive skin. This product is concentrated. Use sparingly. Do not apply more than 3 times in a 24 hour period. Consult with healthcare practitioner if you have questions regarding the use of this product. This product is highly concentrated and is intended for professional use only. This product is for topical use only. Do not apply to broken skin or open wounds. Do not take internally - this is an herbal extract, not a homeopathic remedy. Arnica extract, an anti-inflammatory ingredient in this product, is contraindicated for use by pregnant and nursing women and those taking blood thinning medications. Pure Pro's Hand-Infused Arnica Extract, Grapeseed Oil, Essential Oils of Bergamot, Clary Sage, Siberian Fir Needle, and Lavender, Natural Vitamin E.
Best arnica oil I’ve used! Started using this at a spa I was working at 20 years ago. Continue to purchase it for my private practice and my clients like it so much they purchase it for their home use. So useful for muscle soreness and for bruising. I’ve tried others but Pure Pro is the best! Pure Pro Arnica is the best! I have been using Dianna's Pure Pro products, including her Arnica Oil for 5 years for the occasional sore muscles or bruising. There are many Arnica Oils on the market, but Dianna's products are purer and more concentrated making them far superior to anything else I have tried. Best arnica you can find! My favorite oil, works like a charm. I am a frequent buyer of Pure Pro Arnica Concentrate. I save money by adding drops to the massage oil I use in my practice, and I know the quality of Pure Pro products keeps my clients safe from weird smells, additives etc. Don't ever want to be without it! I think the headline says it all. Next purchase will include Arnica massage lotion to compliment. About a year ago, a friend gave us a bottle of Pure Pro Arnica Therapeutic Concentrate Oil and we were amazed at how well it worked on arthritic knees and elbows. We just ordered four more bottles because we don't want to be without it! Click the button below to add the Arnica Therapeutic Concentrate Oil™ to your wish list.